Durable and stable earbuds with dubious connectivity. If you're a swimmer or runner who also happens to be a die-hard true wireless fanboy, then the Plantronics BackBeat Fit 3100 is a great choice. The attractive flat panels on each earbud are functional and the ear hook design promotes a stable fit. Although connectivity isn't as reliable as we'd like it's par for the course when it comes to truly wireless tech and can be overlooked. Plantronics is recognized as the workspace communications brand. After all, the company’s Voyager models are salient in cubicles of all fields, but today we’re inspecting one of its newer products: the Plantronics BackBeat Fit 3100, a pair of durable true wireless earbuds. For those who prioritize safety over sound quality, these pricey earbuds may serve as a unique stocking stuffer. Editor’s note: this review was updated on April 8, 2019, to reflect new objective scoring method. Who is the Plantronics BackBeat Fit 3100 for? Large earbud housings are counteracted by the ear hook design which facilitates a comfortable, stable fit. While anyone can use these earbuds, they’re intended for athletes—specifically for runners and swimmers. The IP57 certification means that they can withstand dusty conditions and complete submersion. What’s more, the ear hook design lends itself nicely to a stable fit during vigorous movement. If you’re an outdoor runner, the Ambient Aware ear tips will be of use as they’re designed to allow the ingress of external noise so you’re always aware of your surroundings. Listeners receive a 740mAh zippered charging case, a micro-USB cable, and the Plantronics BackBeat 3100 true wireless earbuds. It’s disappointing that the package doesn’t include a spare set of Plantronics’ proprietary ear tips, especially at this price point. How is the Plantronics BackBeat Fit 3100 built? The inside of the case is well designed and perfectly fits the earbuds, but users must be aware of how the ‘buds are placed to guarantee charging. A soft matte finish coats the elliptical charging case, which has an unprotected micro-USB input on the back and houses two precise, textured cut-outs for the earbuds. Set in the center of the charging case is a rectangular button along with four LEDs aligned to indicate the case’s remaining battery. Although the extensive onboard controls are useful, the lack of virtual assistant access is a bother. A flexible silicone material makes up the ear hooks, which feature the same cross-hatched design found in the carrying case. The included silicone ear tips promote safety by allowing surrounding sound in, but this severely diminishes audio quality because of a lack of isolation resulting in auditory masking. Unlike other true wireless charging cases, this one uses a zipper rather than magnets. Both earbuds sport holographic panels, yet only the left one is touch capacitive. From the left earbud, listeners can tap to increase the volume or touch and hold to decrease it. The right earbud, while not a touch panel, grants listeners full playback and call control. As with most true wireless earbuds, even the cheap ones, the Plantronics BackBeat Fit 3100 includes an auto-on/off feature, whereby removing and placing the earbuds in the case activates and deactivates them, respectively. However, about half the time, it seems the earbuds remain on and connected to my device long after returning them to the case. The Ambient Aware ear tip design makes the Plantronics BackBeat Fit 3100 a viable option for outdoor runners and cyclists. Again the IP57 certification renders the Plantronics BackBeat Fit 3100 earbuds nearly indestructible. If you plan to swim with them, be aware that water may still seep into your ear canal because of the ear tip shape. What’s more, using these for outdoor running was excellent, and they provide a more stable fit than bone conduction headphones, which also tout awareness of one’s surroundings as a safety feature. The touch panel on the left earbud is responsive to sweaty fingers and the comprehensive controls allow me to remain focused during workouts, rather than returning to my phone to skip a track. My main gripe with these earbuds is that they don’t feel as stable as they are, which is a consequence of the ear tips. The microphone performs better than anticipated due to the integrated MEMs microphone technology with a dedicated digital signal processor (DSP). When taking calls, people on the other side heard me clearly and weren’t distracted by superfluous background noise. Standalone battery life comes in just below four hours and the included micro-USB cable is difficult to use due to its lacking length. Our objective testing revealed that the standalone battery life of the earbuds’ 90mAh battery is 3.72 hours—which is all right for true wireless but short of Plantronics’ claimed 5-hour playback time. Fortunately, listeners are afforded one hour of playback from a 15-minute quick charge. Additionally, the included 740mAh charging case provides an extra two charge cycles to the earbuds before having to connect via the included micro-USB cable which, by the by, is comically undersized. Connectivity is disappointing relative to other Plantronics products, which flawlessly remain connected. The earbuds struggle when outside. 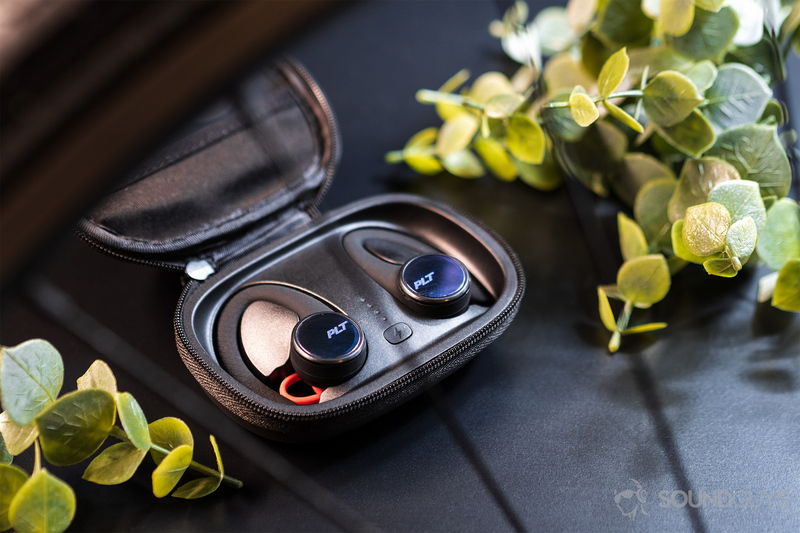 The Plantronics BackBeat Fit 3100 true wireless earbuds operate via Bluetooth 5.0, however, connection reliability falls short of what I’ve come to expect from Plantronics. When outside, be it an open space or a crowded intersection, one earbud would phase in and out. In all fairness, the connection never completely dropped to the point of forcing a manual reconnection, but it remains a nuisance. 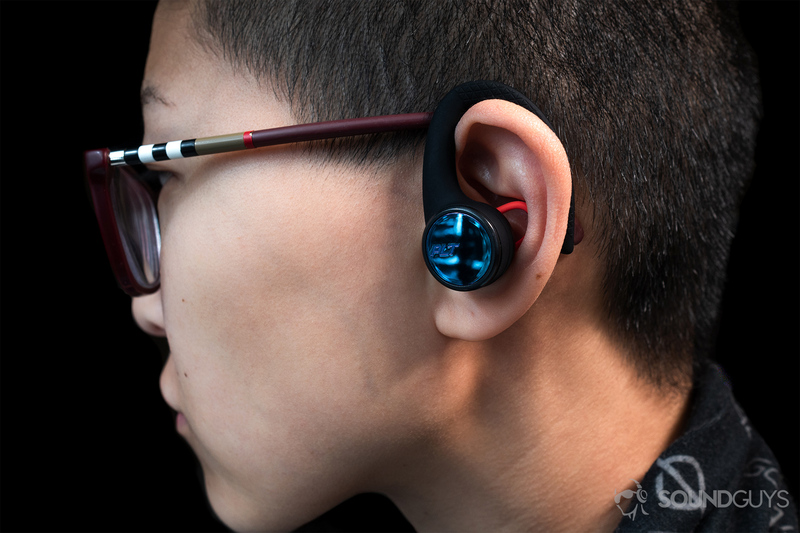 As far as Bluetooth codec support is concerned, the earbuds support SBC alone, meaning that AAC, LDAC, and aptX are excluded from the conversation. It makes sense to forgo high-quality codecs with workout earbuds, though, since most of us 1) aren’t concentrating on audio quality during a workout and 2) are too old to differentiate between streaming quality. How do the Plantronics BackBeat Fit 3100 ‘buds sound? The exaggerated low-end doesn’t sound as emphasized as it looks on the graph due to the lack of a cogent seal created by the ear tips to the ear canals. Isolation is intended to be poor with these earbuds because they’re for outdoor athletes who need to remain aware of their surroundings to stay safe. Due to the lack of seal created by the Ambient Aware ear tips, earbuds are tuned to reproduce audio with significant bass emphasis to compensate. Higher mids, like female vocals, are recessed with slightly more exaggeration heard from treble frequencies. While this sound signature is far from neutral, it’s a great example of why a “flat” frequency response isn’t always appropriate. When working out, I don’t want to analyze a singer’s vocal tenor, rather I want to hear—or better yet, feel—the beat. During the pre-chorus of Sam Smith’s song Money On My Mind, the G-A-D chord progression is audible over the drum hits even with the bass emphasis. In order to hear the bass as it’s depicted in the above frequency chart, I have to push the earbuds into my ears to create a temporary seal. While this works in a sense, no one’s going to be walking around holding the earbuds to their ear canals for better sound quality. Bear in mind, though, that the Plantronics BackBeat Fit 3100 earbuds are for athletes, not audiophiles. If you’re cycling, swimming, or running, the secure fit and durability take precedence. Wild & Wicked World as performed by Hayley Kiyoko involves an array of instruments and clapping to create a beat eliciting feelings of urgency and rebelliousness. That said, the clapping is hardly audible beneath the drum hits—even the cymbals are hard to hear above Kiyoko’s vocals. During the song, the most detailed sound is the repeated A chord played from the piano during the verses. The Plantronics BackBeat Fit 3100 retails for $149.99 and includes IP57-certified true wireless earbuds and a 740mAh charging case. If you’re an aquatic or outdoor athlete itching for true wireless earbuds this is arguably the best package available. Unfortunately, if you’re turned off by the idea of fussy connectivity, it’s a general plague that affects virtually all true wireless earbuds, a limitation of the technology. The design is much more appealing than that of the JBL Endurance Peak and the advanced onboard controls are invaluable during focused workouts. While it would be nice for the earbuds to feel as secure as they are, it’s an easy adjustment to make as the listener. Embrace the outdoors with BackBeat FIT 3100 true wireless sport earbuds. Always Aware ear tips allow you to hear your surroundings for safer training in any environment, while flexible and secure-fit earloops provide comfort and maximum stability. With up to five hours of listen time, these sweatproof and waterproof earbuds can keep up with your longest and most intense workouts.